Monday 11/28: Off day. Delighted to say that the fruity pebbles cookies I baked on Sunday were gone by 4:30pm Monday. Tuesday 11/29: Mile High Run Club “The Distance”. Got a later start than last time but squeezed in 5.5 miles in just under an hour. The different intervals include a warm-up/cool-down pace, marathon pace, half marathon pace, 5K-10K pace, then an all-out sprint. My half marathon pace is very close to my 10K pace now so I tried to take those intervals at the 5K pace. For the final minute of sprints, I decided to really crank it up and saw sub-7 minutes for the first time ever. That was thrilling. I was also proud of myself for keeping it consistent for the whole class and not fading (ahem like the girl next to me). Wednesday 11/30: Gym time. I did 2000m warmup on the Erg, then some light lifting and strength exercises, focusing on my core and abs. Kettlebell swings, medicine ball situps, planking. I was in and out in less than an hour. Time to start squatting and doing pushups again, plus making sure my deadlift form is correct. Thursday 12/1: Track night. We did a warmup, drills, 4 x 800m, then cool down. My splits were (if I remember correctly because I messed it up on my watch then gave up) 4:06, 3:58, 4:08 (coach said minus 10 seconds for tying my shoe after the first lap but it was a struggle after that), 4:01. One of the coaches congratulated me on my 5-mile PR but said I needed to be running more miles in general (even though I’m “just” 10K training), closer to 18-21 a week. So that set the tone for my planning of the rest of the week/month/year plus my future spring half training. Also, I had Shake Shack for lunch which was delicious but not a wise decision before speedwork. Thought I was going to puke on the last one. It was great to be doing this with so many wonderful teammates. Saturday 12/3: Unexpected day off because I was hungover from several hours of happy hour the night before. Sunday 12/4: Long run; I combined a ~4 mile run to DUMBO with my club with 3 beforehand to and around Prospect Park. This was my longest run since the marathon. 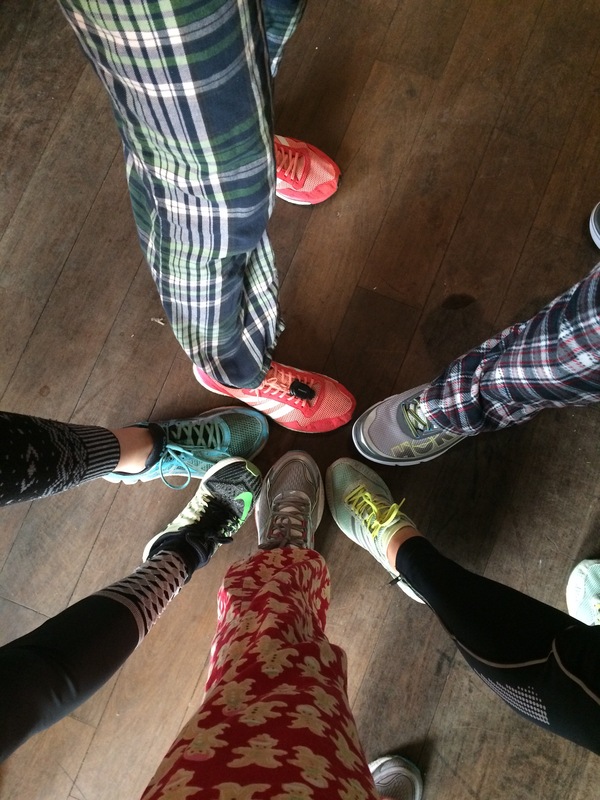 It was a pajama run, so I tied my gingerbread man PJ pants around my waist for the first 3 miles (and felt a little ridiculous doing so), then wore them for the next 4 to a coffeeshop in DUMBO. Ended up walking home with pants tied around waist again. Sunday 12/11: My new longest run since the marathon, which was 9.6 miles to Levain Bakery from Brooklyn.If I had run from the original meeting point, it would have been over 10 miles and I’m still saying no freaking way to double digit runs, at least for a few more weeks. I stayed conversational the whole way but after we got a sub-10 mile for #7, I was so tired and hungry for the last 2.6. To be fair, it was after 12:30pm at that point since we had a post-10:30AM start. Weekly total 12/5-12/11: 9.6 miles and some dancing. Other things of note: I only booked and went to one ClassPass class (Mile High Run Club’s The Distance on 11/29), so I’m scrambling to fill up the last week of my cycle. This should be fun! I’m trying to incorporate more strength training and cross training, so I’m doing yoga (flow AND restorative), foam rolling and stretching class (heaven after I run there), plus my good old standby spin. I got into the NYC Half AND the Fred Lebow Half, so I’m basically going to be training for halfs the next several months. Guess I’ll need some legit winter running gloves. 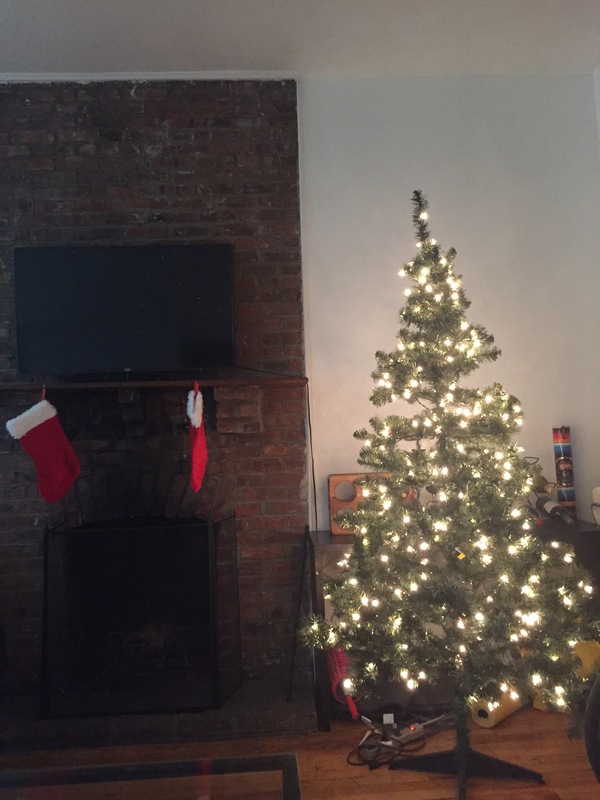 And my roommate and I put up the Christmas tree that was in storage above my closet. It’s beginning to look a lot like Christmas.